As a parent of young children, I can honestly say that the most important thing I strive to impart to my children is a sense that they are not the center of the universe. In this egocentric society in which we live, I hope to foster a desire in them to consciously and deliberately help others in need and make it an integral part of their development as humans. Tall order? Yes, probably. But that is no reason not to try. I have started planting seeds already that I hope will create a snowball effect, hoping the help and care that I encourage my children to give others will prompt them to initiate their own efforts now, and later in life, toward good for those in need. 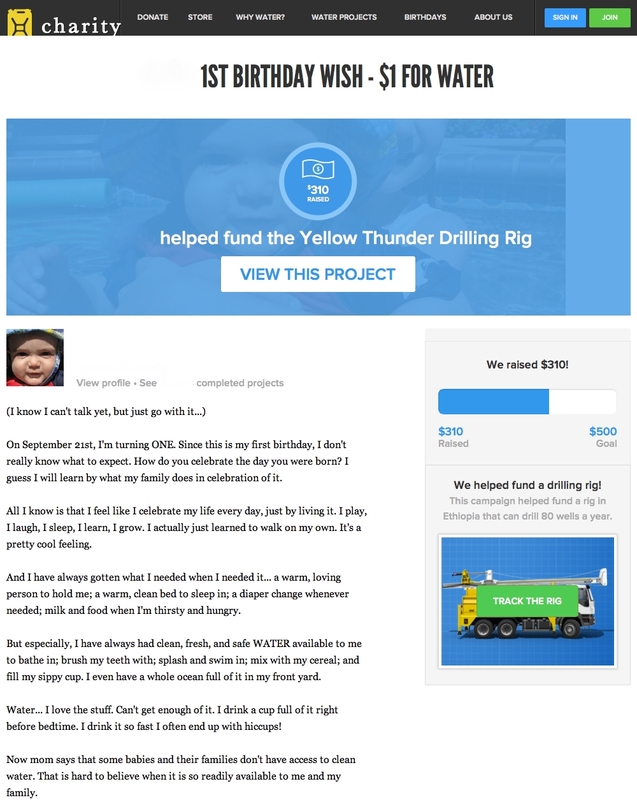 In the end, my chubby little one-year-old raised $310 to help bring clean water to people in a village in Ethiopia. The idea of creating awareness in my kids that not everyone in the world has the same existence as they do is so important to me because I believe that without it, the risk of entitlement and unrealistic expectations setting in is far greater. One way I try to create some awareness is by having them be an active part in donating things they individually, or we as a family, no longer could use. When they were really little babies, I would call the local rescue mission to send a truck to pick up any backlog of kids clothes and toys that they’d outgrown, or I'd sell them at a consignment sale. But last December, as my daughter was on the brink of turning seven and my son was a little over three, I decided to create the opportunity for them to personally donate their outgrown items to kids in need. We loaded up the car, brought the stuff ourselves to a women and children shelter up the coast, and my kids helped carry the boxes inside to where the residents were just finishing up dinner. Babies, kids their age, and women, one even pregnant, greeted us warmly but with a slight sense of bewilderment about why we were there bringing our donations to them in person. My kids were apprehensive too - they didn't really understand what we were doing there and why we were doing it, even though I had thoughtfully explained it to them previously. After we left, my seven-year-old asked me why they all lived together in one small building. She inquired, "Why don't they just buy a house?" I explained the reality of the situation to her again and she seemed to take it in and contemplate it without further discussion. My three-year-old may not have absorbed the significance of what we had done this time, but maybe he will remember doing it, and other acts of kindness like it that follow. At this point, I am banking on a cumulative effect to take root in both of them. Another effort made to create awareness also had to do with giving clothing away, but this time it was in a very different way. 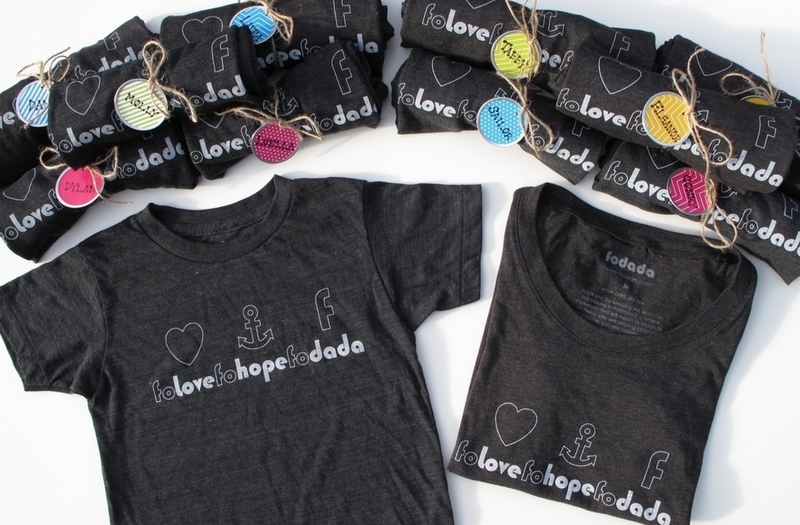 For her 7th birthday party, my daughter and I designed our own t-shirt to give away as a party favor to her friends and their moms through fodada's "tee that could" program. We did this because a portion of the profit from creating the tee would go to the charity of our choice, and we chose to aid the victims of Typhoon Haiyan in the Philippines. THE T-shirt we DESIGNed . MY DAUGHTER MAILED the DONATION CHECK Herself TO THE SUPER TYPHOON HAIYAN RELIEF FUND/GLOBAL GIVINGWITH A NOTE about hOW SHE RAISED THE MONEY. THEY SENT HER A Letter BACK THANKING HER FOR HER AWARENESS and GENEROSITY. The idea was to give our guests a party favor with a positive message that was created to both help others in need and give them a nice gift to remember the occasion by (as opposed to a favor bag full of plastic trinkets that will end up in a landfill). This piece of clothing we created, in addition to helping the Typhoon victims, brought awareness to a group of seven year olds that the people beyond their own individual lives exist, and that they MATTER. My goal was to model for my daughter and her friends that, as human beings on this Earth, we have the power and responsibility to offer assistance to those in need; and that in doing so, we foster good for all. Everyone loved their tees, and the design we created symbolized the power of love, the promise of hope, and the potential for giving, sharing and inspiring others. These are the acts of charity I want to foster... these are the behaviors I want to integrate into my kids' daily lives... these are the thoughts and feelings I want to become part of the fiber of their beings as they grow. Why is it such a challenge? Why are these isolated acts so few and far in between? Why as a parent do I find myself trying so hard to bring these issues into focus for my kids in the midst of so much to the contrary? Most people are just trying to do their best to improve and secure their family's present and future, and don't mean to leave philanthropic endeavors out of their kids lives. They may feel that have little time and energy to invest in people outside their realm of reality - and they may even ask... why should they? Isn’t it their job as parents to focus on giving their kids all they can to ensure they are as happy, healthy and carefree as possible? “They’re kids! They deserve to be spoiled a little!” or "Oh come on, they're just kids... they don’t need to be burdened with the harsh realities of the world at their age!” are both real responses I have received after sharing how I limit my kids’ acquisition of toys and material things and how I deliberately expose them to philanthropy and charities that aim to relieve other people of their hardships. Maybe they feel I am doing it all wrong. Fair enough. Or maybe I feel they are the ones doing it all wrong. Judgements aside, I would bet no one is doing it ALL wrong, but rather we all just have a different approach to parenting, and I would bet, to the world in general. We all know the best of intentions are often behind the most misguided of actions. I've seen some extremely generous and well-meaning individuals shower their children and grandchildren with material gifts with such reckless abandon, having absolutely no problem with giving their two, three and four year olds whatever their hearts desire in the way of toys, games, and clothes. They show pride in the fact that they have reached a level of success to afford this wealth of tangible amusements to give their little angels, often citing that they were not as lucky when they themselves were children. But in their desire to give these kids a better reality, is it possible they don't realize that they just replacing one extreme for another? Do they wonder whether or not the hardships they endured in their lives may just be the key to why they are successful today? In a few years, it is entirely possible that these individuals may find themselves ironically uttering phrases like, “What makes these kids so entitled? ", all the while not realizing that their kids are only living and reacting to the reality in which they have been exposed to since infancy. Treated like the world revolved around them and given everything they wanted when they wanted it, some kids have unwittingly been bred to think of themselves first and only. Expecting the precious toddlers that were given the moon to transform into into generous, non-egocentric, philanthropic pre-teens and teenagers (instead of being labeled "spoiled brats") seems not only unfair, but very unrealistic. I don't have a grandiose solution to this dilemma, and I know I sound like I am preaching from a soapbox. But nothing is black and white in issues like this. I myself have to reconcile my own childhood and young adult experiences of abundance and scarcity, and how they inform the way I feel and behave in the present. I hope to find more ways to spark dialogue on this topic to generate some action among those parents who would otherwise not have thought about philanthropy and how it relates to our and our kids' future. One thing I know is that even something as simple as encouraging kids to donate books they have outgrown to their local library will play a small part in creating awareness in them for the act of giving. It's as simple as first planting the seeds and then tending the gardens of our children's minds and hearts. Doing what we can within the realm of our own realities to promote an attitude of YOU matter as much as ME... that's all. If WE all can do this together, then maybe we can all live better.